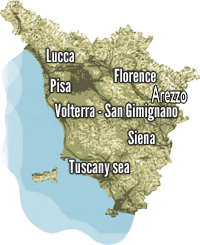 Located near to the beautiful town of Lucca is a superb development of apartments situated in the magnificent Tuscany countryside. Luxuriously appointed with an impressive array of facilities and services. Fitness centre, spa, tennis, swimming pool. Screened from the road, the stately aspect of the Villa, gives the estate its imposing character, whilst at the same time guaranteing a high degree of privacy. The extensive area of the Villa has allowed the “Piano Nobile” to retain all of its original features, the first floor has a particularly charming apartment and the impressive apartments on the second floor all offer spectacular views. The wine cellars now house a Spa with a unique atmosphere, open all year round. The Spa is composit with heated swimming pool and Jacuzzi, sauna, fitness room and relaxation areas.Thanks to its position above the plains of Lucca and Capannori, the panoramic vistas from the villa, the park and the Borgo ensure that guests feel an immediate sense of tranquillity and relaxation. Villa enjoy grounds worth of such a prestigious estate in which can be found an outdoor swimming pool on a natural terrace enjoying day long sunshine. The extensive park has many mature trees including an imposing cedar tree at the front of the villa, enclosing the estate in a totally natural environment. Completing the picture is an historic “Belvedere” over “la vallata di Lucca”, and a clay tennis court both for the use of residents. The estate has a security CCV system active 24 hours a day and night porter service.Secure car parking space with direct access to the park. L1072 -1 Quadri (6 people) Located on the 1st floor of the Villa (39 steps) the apartment is one of the largest and most attractive in Villa, and thanks to its many windows, it is very bright but also offers a wonderful panoramic view to the south of the valley and an excellent view of the sunset to the west. The apartment comprises two levels and has 2 bedrooms, 2 bathrooms and can accommodate up to 4+2 guests. On the ground floor of the apartment, there is a living / dining room, a very modern and well-equipped kitchen, a lovely modern-style master bedroom with superb four poster bed and en-suite bathroom with tub. On the upper level (16 steps) there is another modern-style double bedroom with en-suite bathroom with shower and a delightful skylight right above the bed, which allows you to admire the stars at night. The apartament has traditional “cotto” and parquet floors as well as wooden beamed ceilings. This is certainly the perfect place to start your dream holiday in Tuscany. GIt has a very spacious and well-lit open-plan living area and thanks to the special lighting effects in the apartment, at night, you can achieve an extremely cosy atmosphere- these include low lighting, a lit stairwell (several different coloured LED lights), ground lamps that stand around one metre tall, and spot lights on the ceiling The spacious lounge area is furnished with a leather sofa, placed in the centre of the room along with separate adjustable seats. There is also a marvellous home theatre with elegant and very comfortable sofas, a 50-inch flat screen lcd TV, Dolby surround sound, and satellite. The dining area is dominated by a large 10-seater oak table and a well-equipped and modern kitchen (with large American fridge-freezer) set in stainless steel. An elegant bathroom with shower (which appears to be hidden when in fact it operates from behind the wall) completes the ground floor. Price accommodation includes: towels, bed linen, utilities, SPA, Tennis, Parcking, xternal swimming pool (opening mid may – mid september), dishwasher, washing machine, ,TVsat.